If you’ve already bought someone a gift card for the holidays, don’t read the rest of this article. It’ll just make you feel bad. Okay, still with me? 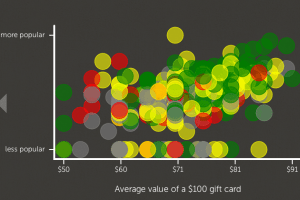 It turns out most gift cards are worth less than their face value. Quite a lot less—at least, judging from the resale value of gift cards on exchanges like Cardpool, Plastic Jungle, GiftCardRescue, and Gift Card Granny. These marketplaces say the average value of a $100 card is more like $72 if you try to sell it to someone else for cash, according to a survey by San Francisco-based GiftRocket. The Y Combinator-backed startup, which we profiled here in April 2011, isn’t exactly an impartial source. It’s trying to get people to give up on the plastic stored-value cards you can buy at Walmart, Starbucks, Barnes & Noble, and hundreds of other stores and switch to its all-digital cards, which, of course, are called GiftRockets. The argument is that GiftRockets, which can be redeemed for cash, are always worth the face value. But the fact remains that a lot of gift-card recipients find it inconvenient to use the cards, and end up trying to sell them for hard cash, which is far more fungible. And when they do that, they take a big hit—up to 50 percent for the less popular cards, according to GiftRocket’s study. A store-brand gift card’s main selling point is that it’s not as gauche as giving cash. The message is “Go buy yourself something nice at this store I know you like.” And after all, it’s the thought that counts. But it might be nice if the thought didn’t come with so many strings attached. “Basically you’re giving them a more restrictive form of money in exchange for the packaging,” says GiftRocket co-founder Kapil Kale. GiftRocket shared the results in an interactive infographic published yesterday. The startup found that the average resale value of a $100 Whole Foods gift card is $91; Walmart, $87; Toys R Us, $82; Starbucks, $80; Barnes & Noble, $77; Lord & Taylor, $70. The larger the retailer in annual-revenue terms, the more value their cards retain, the startup discovered: Cards from national giants like Best Buy, Walmart, Costco, and Target snag the highest prices on the resale markets. Small retailers like Shopko, a chain of 13 stores based in Wisconsin, suffer worst: its cards go for only 60 cents on the dollar. This is only true if the recipient’s sole desire is to reap cash out of the gift card. And, the point about digital is there’s a higher likelihood these will go unredeemed because there is no physical reminder and don’t seem so much like a gift plus not everyone knows they can be redeemed for cash because there’s a retail brand name associated therewith–which just puts more money in GiftRocket’s pocket. PEOPLE: The gift card can be worth much more when spent after the holidays during the enormous markdown period. Additionally, there are so many gift card promotions this year, the purchaser likely got a bonus on top of face value initially anyway. Some will give to the recipient and some will choose to keep for herself, but the point is the single transaction produced a dividend. I agree with you 100%. People don’t realize they are restricting others by giving a gift card of a particular store. lol..i was thinking the same thing. GiftRocket just wants to get rich by taking an additional 5% of the gift card price from you… what service do they really provide? They put the gift money in someone else’s paypal account (which you can do easily for FREE). It is quite ridiculous, really. But they’re hoping you will be in “gift giving mode” and just spend whatever it takes to send someone a fast gift card, stuffing their pockets with your hard-earned money, and doing almost nothing for you. yes whos paying attention to the photo being posted of the founder of the company? and where im from that hand gesture had a somewhat obscene meaning….what a dork. instills buying confidence! What kind of business model is GiftRocket? You pay up to 10% for “the privilege” of sending an e-mail to someone that they have a gift, which has to be applied for and then they have to wait days to weeks to get the money on their charge card, Paypal or bank account–exposing all of that information to hackers and ripoffs. There is no charge to send a check or get a Restaurant or Retailer to send them a gift card. One logical use that does come to mind is to launder money, but this is still a stiff rate to pay for that purpose. Also to note, GiftRocket has a telephone number that is never answered and has absolutely no customer service.